Last year, New Jersey’s challenge to the proposed summer flounder regulations made history. It was the first time that the Atlantic States Marine Fisheries Commission (ASMFC) decision to deny a state’s proposed season framework and find a state “out of compliance” was overturned by the Secretary of Commerce. This decision resulted in New Jersey implementing our proposed summer flounder season of 125 days with an 18-inch minimum and three fish limit. The post-season analysis of our harvest, through surveys of recreational anglers, found that New Jersey did not exceed our total allowable harvest. Overall, summer flounder harvest was down coastwide, allowing a more liberal season this year. The unprecedented decision by the Secretary of Commerce caused shock waves up and down the coast. Although I am pleased with the Secretary’s decision, criteria for challenging the ASMFC are tough to meet. And quite frankly, the deliberative and collaborative ASMFC process is thorough and most often fair to all states, considering the difficult decisions that must be made. It is important for all member states to work within the ASMFC structure and to accept the collective decisions, based on sound data, necessary to ensure our migratory fish species are conserved. Anglers should not expect to, nor should we desire to, buck the system every time a decision does not go our way. After all, the goal is to rebuild the fishery for better fishing in the future. Over the past year I learned just how complicated marine fisheries management is. New Jersey’s biologists, biologists in the other coastal states and the ASMFC staff all spend a great deal of time collecting data, crunching numbers, running the fisheries models and putting in long hours at meetings to collectively come up with appropriate harvest recommendations. Commission members must set harvest quotas that protect the fisheries resource for the future and satisfy the present interests of the commercial and recreational anglers. That is not an easy job. The most significant way you can help the process is by providing the data to feed the models. In this Digest there is a reminder about the Access Point Angler Intercept Survey (APAIS). If you are approached by one of our employees at dockside, please take the time to participate in the survey, even if you had a bad day of fishing. Days when you catch little or nothing are important. If only successful anglers participate in the survey, our harvest numbers will be inflated and future seasons may be affected negatively. You can also participate in our Volunteer Angler Survey using your home computer or smartphone. One of New Jersey’s biggest marine fisheries challenges is having adequate staff levels to gather the data, do the research and make our case at these interstate fisheries meetings. Although retirement has stolen from us several valuable personnel in recent years, I am happy to report progress. 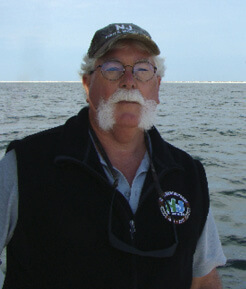 This spring Fish and Wildlife’s new Marine Fisheries Administrator, Joe Cimino, takes the helm. Joe was the assistant director of Virginia’s Marine Resources Commission and is quite the catch! As we welcome spring, please join me in welcoming Joe to our ranks as he takes on the challenging administrative responsibilities associated with managing our marine resources. He has a great crew to work with and a body of anglers eager to reap the rewards of his team’s work. So let’s go fishing! Larry Herrighty is the Director ­­of the Division of Fish and Wildlife.